Software piracy is a real issue for every software company, large and small, and it isn’t going away any time soon. So when I heard that fellow microISV owner Nikos Bozinis had created a tool to help software vendors fight piracy, I asked him to write a guest post. He kindly agreed to write this post about software piracy, the Digital Millennium Copyright Act and his CrackTracker product. Why buy something when you can download it ‘for free’? Billions of dollars are lost every year from illegal downloads of music, movies and software. People around the world seem to have very lax morals when it comes to abusing digital content. Downloading the latest movie or windows software from rapidshare.com somehow doesn’t strike them as theft — it’s not like stealing a loaf of bread! The traditional music industry is already down on its knees as a result, and software may be the next to follow. Software authors and music enterprises are fighting back by tightening the DRM (Digital Rights Management) of their products in a futile effort to stop online piracy. But usually crackers have no problem circumventing any protection system that we can dream up. To add insult to injury legitimate customers are usually hurt by such reinforced software protection and activation systems. A little bit like the war on terror, isn’t it? A different line of defense for ailing copyright owners is the Digital Millennium Copyright Act (DMCA), a US law with global reach for copyright protection (the european EUCD equivalent is not as broadly known). This law is very broad, and not without controversy, but it works – closing down websites that distribute illegal content and removing copyright infringing downloads from file-hosting websites with summary procedures, among other things. So if you discover your software illegally distributed in some warez website, you can send a so called “DMCA section 512 takedown notice” to the website host and they are expected to remove that particular file from circulation — or risk the wrath of the law. I have been a microISV for over 10 years so lets forget about the entertainment industry and concentrate on my field, software. There are over 200,000 programs listed on download.com and that’s just for Windows. Many are created by very small to medium sized companies — many even run by a single programmer/webmaster/marketer/entrepreneur. I bet that all these programs are cracked in one way or another — at least those popular enough for crackers to care about them. If you search for warez or torrents you will find the software you want for free, either the latest or an older working version. Piracy statistics from Business Software Alliance report 2009 (click image to enlarge). I sell a file manager called xplorer². I track how many people install the program every day and also I have a good guesstimate for the number of people using cracked versions of xplorer². I estimate over 70% of the regular users use one of the known keygens. Imagine if this 70% didn’t exist or it was converted to regular paying customers! Downloadable software falls into 2 categories: those that run in trial mode until you buy a key to unlock the full functionality; and those that are special downloads for customers that pay the registration fee. In all cases some sort of unlocking takes place using a plain key, or a license file, or online activation, or some combination thereof. Many ISVs write their own licensing code, while others rely on off-the-shelf protection and licensing products (Armadillo, WinLicense etc). Imagine you shipped your source code along with your program, then it would be trivial for even amateur crackers to bypass your protection and run the program without paying. Very few vendors supply source code, but people in the know can read off your licensing logic like an open book using specialized reverse engineering tools (softICE, IDA and other debuggers and disassemblers). Then they can create a ‘patch’ or modification to your executable that bypasses the protection. An even worse type of compromise is a keygen. When the cracker uncovers the logic of your unlock keys, he can create a program to generate such keys which look and behave exactly like the legitimate ones you sell to your customers. Then he doesn’t need to patch your program, he just supplies this keygen to the warez community and everyone can help themselves to your program. You can guard yourself against such attacks using asymmetric encryption algorithms for your keys. Is there a perfect protection system? In short, no. If you consider that your program is presenting its logic to anyone with moderate experience in machine language, then sooner or later any protection can be circumvented. Professional protection schemes utilize encryption to protect sensitive parts of your code, but even they won’t withstand the cracker test. And remember the harder your DRM the more likely your program will be mistaken for malware (!) as many viruses and trojans use encryption tricks. Even if there was a perfect system, your sales would still be at risk. All that’s required is some of your customers to post their unlock key in a warez site, and the game is lost. You would then blacklist that serial, until another one was leaked and so on. There are people who don’t spend any time in Facebook or YouTube. They surf the internet for free stuff. Cracked versions of commercial software (aka warez) circulate in some shady forums that bring together the crackers with the downloaders e.g. http://www.warez-bb.org. Browse a warez site and you will find any software, movie or music you fancy, with an assortment of popups and dodgy advertisements of the usual internet 3P products (Pills, Poker and Girls [sic]). For your convenience there are even specialized search engines that search a number of such forums simultaneously, e.g. http://www.warez.com. These forums do not host the actual files. They refer the traffic to specialized file hosting services like rapidshare.com. To make the most of warez you need to buy a subscription to access such file hosting sites (e.g. unlimited downloads from $9/month). Incurable cheapskates could get away without paying anything though, as you can download for free after a forced (nag) waiting of a minute or two. A bit more up-market are download sites where to gain access you need to purchase a subscription, e.g. http://www.nowdownloadall.com. I have never paid to enter such a site, but they promise access to any download you can imagine. So you pay a monthly fee to download as much as you like. Note that this is different from paid-for hosting mentioned above. I suppose that you need a file hosting subscription on top to get the actual files downloaded. With so much stuff available for free I don’t know if this approach makes economic sense. Finally there are traditional peer-to-peer file sharing networks, where people share their software music and video through torrents. After the demise of Napster torrents are still strong, with completely decentralized databases immune to legal intervention. The downside of torrents is their inherent unreliability, so people in a hurry will prefer the immediate gratification of a full download from rapidshare.com and the like. For kicks. The traditional hacker stereotype is a geeky person whose pastime is breaking into computer networks. Cracking into a software’s protection and stripping it clean must be a pleasure in itself, a ritual destruction of the evil Death Star. Distributing malware. Many downloads are packed with malware (sample report for a keygen), from straightforward scams and ransomware to trojans that turn your computer to a zombie, waiting for instructions to launch a DDoS attack or send spam. If your software is available to download from warez sites, either compromised (patched or keygened) or simply accompanied by a simple serial number to unlock it, you will definitely lose sales. The good news is that, using DMCA provisions, you can have these unauthorized downloads removed. Without these downloads prospective users will have no choice but to buy your software — or move on to your competitor’s cracked software. Find your download links. All illegal downloads end up in a host like rapidshare.com or megaupload.com (I know of more than 100, but there are 10-20 big player websites). A standard Google search for your software name plus ‘crack’, ‘keygen’ or ‘rapidshare’ will find some hits, especially if you search in groups or blogs. Even better use specialized warez search engines like http://www.filestube.com with just your software name as a keyword — the results will be just downloads. Validate download URLs. Some of the download links you discover may be dead (e.g. very old). Click on each one to see if they are valid or 404. Send DCMA notices. Group the download links by provider (rapidshare, hotfile, etc), and send a DMCA notice to the abuse email address of each website. Usually this is abuse@website.com (e.g. abuse@rapidshare.com). Each website lists the steps for filing DMCA notices for file removal. This sounds like a lot of hard work, and it can be, but it works. File sharing websites like rapidshare.com run a legitimate business — they are not responsible for cracks — so if you send them a polite DMCA takedown notice they will remove the copyright infringing downloads. Strictly speaking when you send a DMCA notice you are making allegations of copyright infringement, which is a serious crime. You would imagine that a formal complaint should be launched under the guidance of a solicitor/lawyer. Given the amount of copyright infringement that goes on, the red tape would bring everything to a standstill. The beauty of the DMCA law is that it simplifies the procedure. Sometimes a plain English email explaining the situation to the download site, along with a list of your download locations is all that’s required to have the links removed. A few websites require a more formal DMCA email including details such as your company address, contact telephone numbers, and some boilerplate statements like “I swear, under penalty of perjury, that the information in the notification is accurate…”. You can find many sample DMCA notices online so I won’t repeat them here. The general idea is that you present yourself as the copyright owner and declare the download URLs as unauthorized, and therefore infringing your copyright. DMCA is very good for removing illegal downloads hosted in popular file sharing websites, but it is powerless against torrents. There is no single source for the download, as the files are kept in many computers. You would have to contact each and every person who shares illegal copies of your software in the peer-to-peer network. This would be hopeless and a waste of effort. Thankfully for the ISV, torrent use is on the decline. People prefer direct downloads of the full package instead of slower peer-to-peer downloads. Even if one wipes all the illegal downloads, new ones will appear over time. So the locate-report-remove cycle must be repeated regularly. This was the motivation for writing Crack Tracker, a tool that simplifies the removal of illegal downloads. 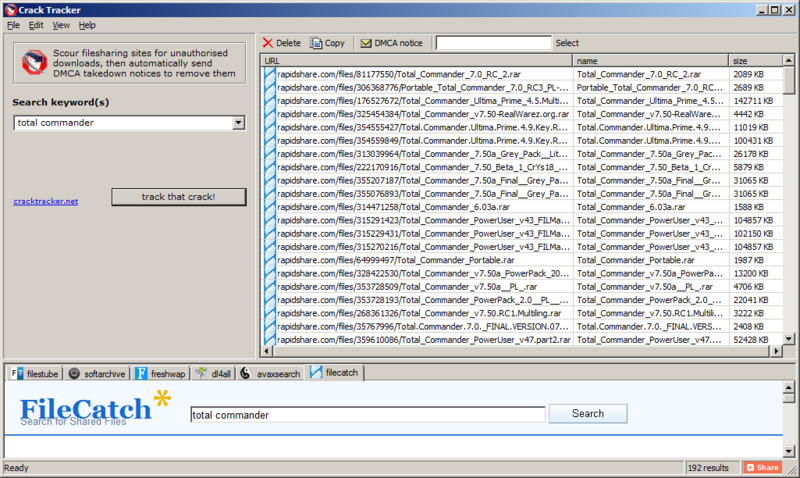 Crack Tracker is a desktop tool, with a meta search engine that securely scans warez databases for your downloads. You supply the search keyword (e.g. your software title or company name) then crack tracker will do an exhaustive search, collect a list of suspect download locations and verify the links with robotic efficiency. After you examine the results you just hit a button and the relevant DMCA emails are sent automatically. It doesn’t get any easier than that. Crack Tracker doesn’t have a fancy user interface but it is very easy to use. It knows of more than 120 file hosting websites and works with 6 major warez search engines (the list is expanding). It is free to try as a search engine; to send the actual DMCA emails you need a registration, but I believe the price is very reasonable, especially if you consider the money you lose in pirated versions of your software. Why don’t you try it for free and see how many cracks of your software it finds? Nikos Bozinis ditched his Process Systems Engineering PhD to run his own microISV ZABKAT since 1999. He also writes a weekly blog focusing on file management and occasionally on programming, debugging and running a software business. This entry was posted in article, guest posts, microISV, piracy, software, tools and tagged crack tracker, cracks, cracktracker, DMCA, keygens, microISV, Nikos Bozinis, piracy, rapidshare, software, warez, xplorer2, zabkat on 25 January 2011 by Andy Brice.